Thomas Willard received a PhD in English in 1978 from the University of Toronto, where he was a junior fellow of Massey College. Since then he has taught English and Religious Studies at the University of Arizona. He wrote his PhD thesis under Northrop Frye's supervision and has published a number of related essays, most recently on the Rosicrucian manifestos in Britain, in Aries: Journal for the Study of Western Esotericism (Jan. 2014). He introduced Frye at a double session of the Modern Language Association organized in Frye's honour and co-edited the proceedings with Robert D. Denham. He has also contributed chapters on Frye to seven other books, including the Festschrift for Frye (1982) and the forthcoming volume of essays from the 2012 conference on the centenary of Frye's birth. 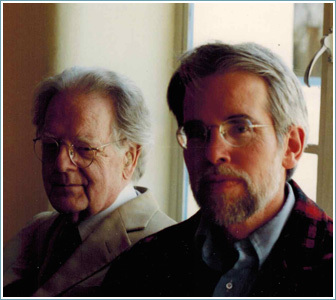 [Photo: Northrop Frye and Thomas Willard, Arizona, 1990].